I learned a lot from In Full Bloom. Each block has a separate quilting motif, so I machine quilted it block by block… and subsequently had to tie off ALL those ends. 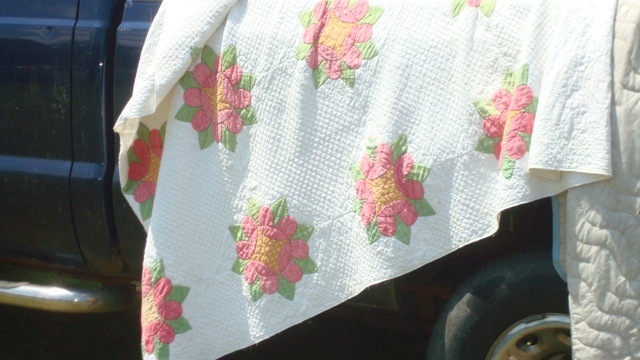 I am hoping to get my quilting mojo back. What? You thought I never lost it? I had to smoosh two photos of Airship together because I couldn’t step back far enough to get all of it in one shot. It’s as if all my design decisions lately have been ordinary and uninspired. Sure, I’ve been excited by the fact that I’m actually getting quilts finished and bound, but I’ve been second-quessing myself for a while now. I have been asking my friends (and some of my fellow group members on Yahoo and Facebook) for suggestions and advice. So, what happens to you went you get “unconfident” in making design decisions? 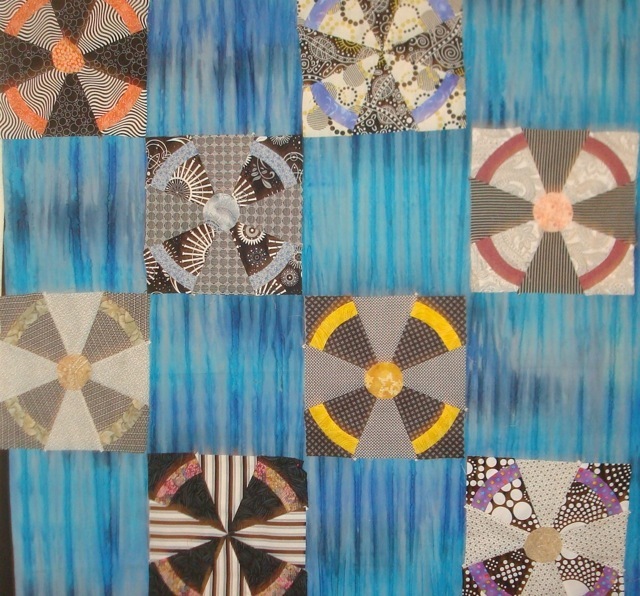 Half-square triangle border strips for Borderpalooza quilt Les Filles Des Mares are done! Do you stop what you’re doing and just stew on the decision? Do you just keep plugging away and hope you don’t “ruin” what you’re working on? I hit a wall on my current book “The Echoes” and decided to write the plot in the first person from the protagonist’s point of view, as if she were keeping a diary. I crept up to the point in the story that I had gotten stuck and found that I had more ideas of how to continue. Success! Getting confidence back in making design decisions is going to be harder than I thought. I didn’t like the bright blue background for Airships. I changed it to a green even though it’s not “conceptually right.” I like it better. I find it’s a better tonal balance, but do airships really fly in green air? And no one but me seems to like it. 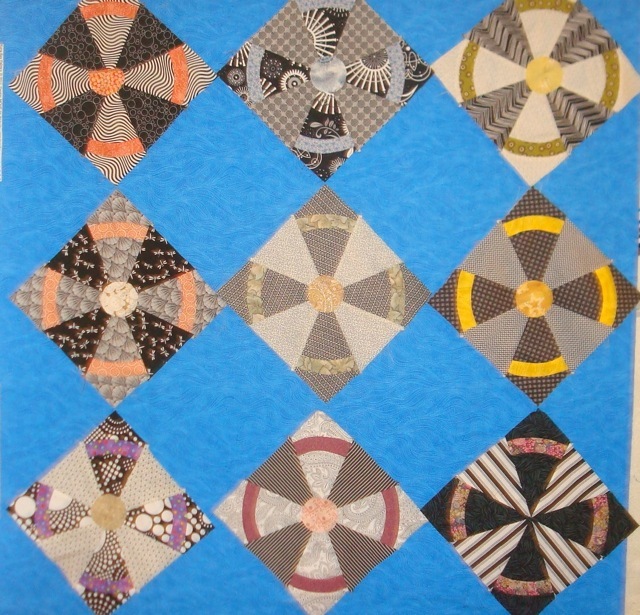 So, I’ll be working on appliqueing the center circles on the blocks for a bit and trying to decide if I should search for a different blue or keep the green the way it is… maybe use a contrasting color for the quilting on those blocks. 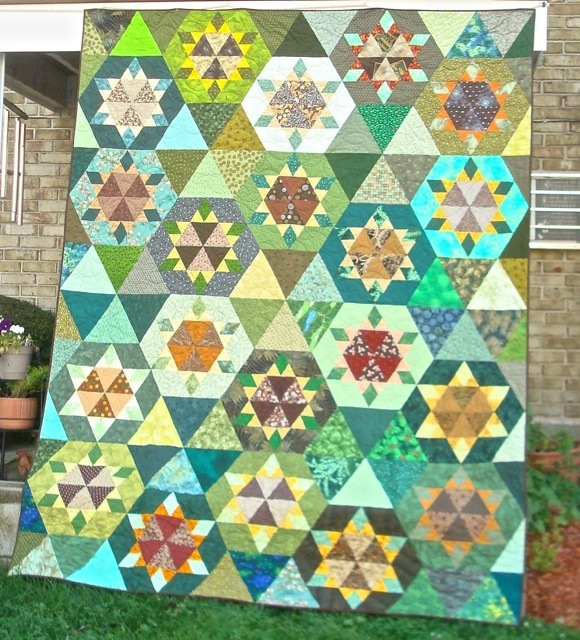 In case I missed showing off the completed DayStars, here it is. 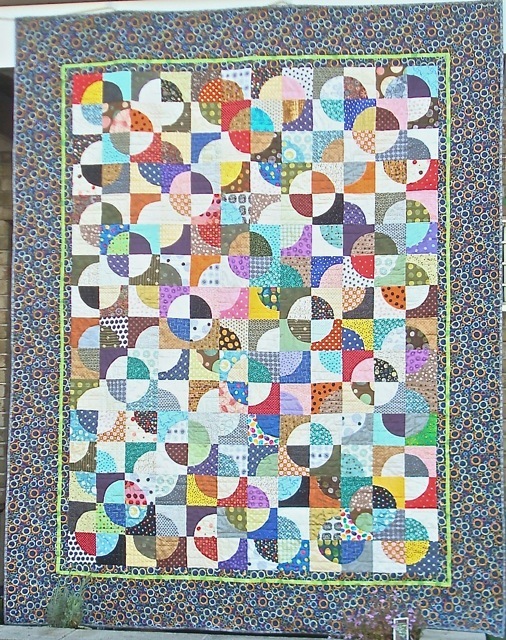 I didn’t do the same Baptist Fan pattern I did on Catherine Wheels, but “bubbles.” It’s cute! Sunflower Lattice is finally done! Now I can make a date to meet my cousin and aunt for lunch and give it to her. 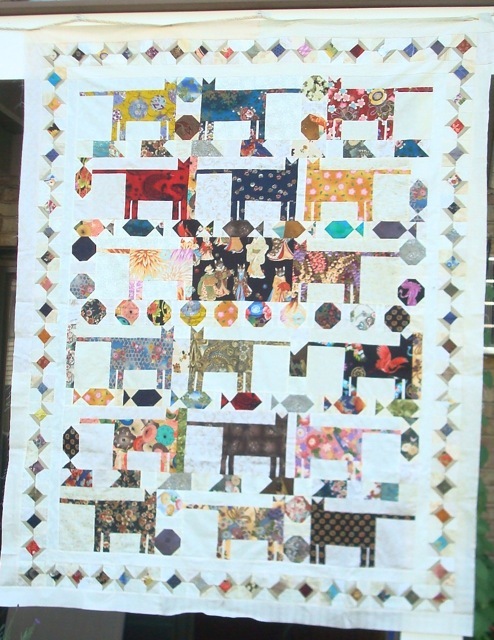 The first Borderpalooza top: Japanese Cats is now ready to “age” for quilting. So what am I doing today? 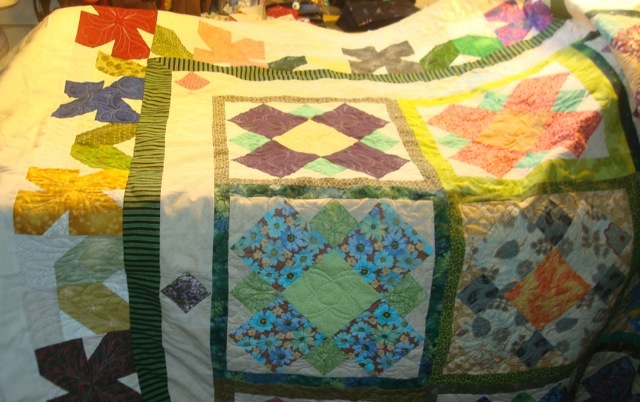 I hope to finish the quilting on In Full Bloom, and to start assembling Airship blocks into a top. 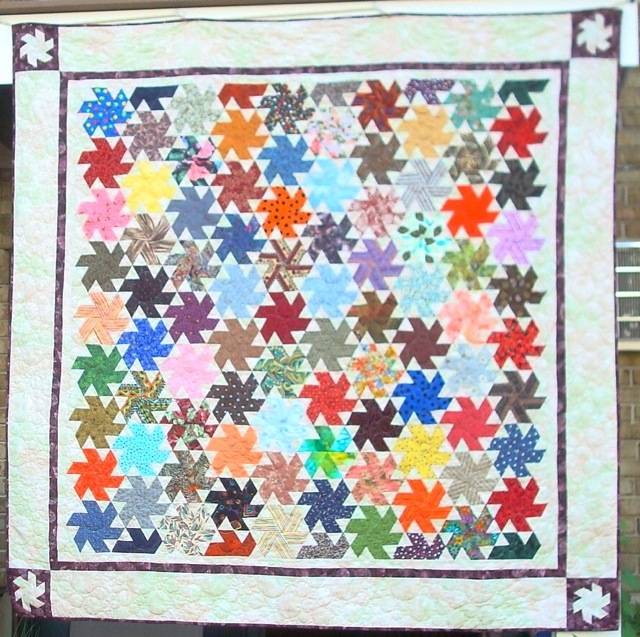 I am also still sewing HST together for the border of Les Filles des Mares. Not sure this blue is the way to go, but I’m liking the “every other” block layout. I’m still a slug (although I have been writing between 250 and 500 words each day since the beginning of the month.) 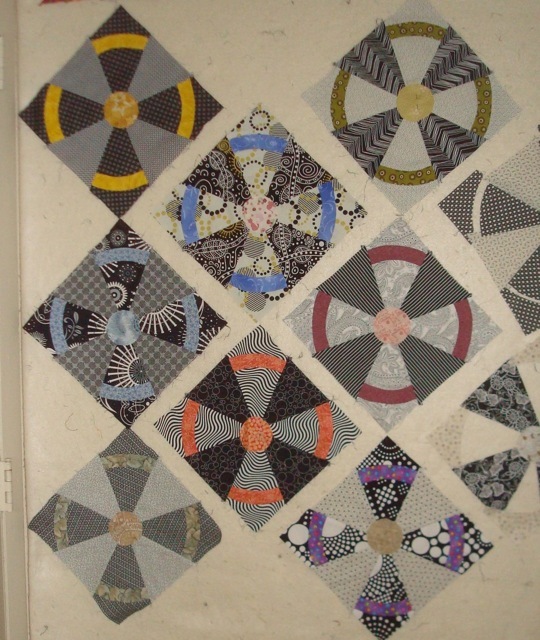 I still have not taken a picture of the completed quilts and tops that I have mentioned in the recent past. I have, however, been making my peace with the Airship blocks. I’ve decided that they are just too “energetic” to be sewn side by side, which, to me, means either a secondary block, or a very wide sashing. My first was just a plain “every other block” layout. I did like that it calmed the blocks down, but it means that I have to do so real searching for either a fabric that holds up to the energy of the Airship block, or a secondary block that does not take away from it. My favorite layout so far. When I was testing, I was using blue, but I’m not wedded to that color either. 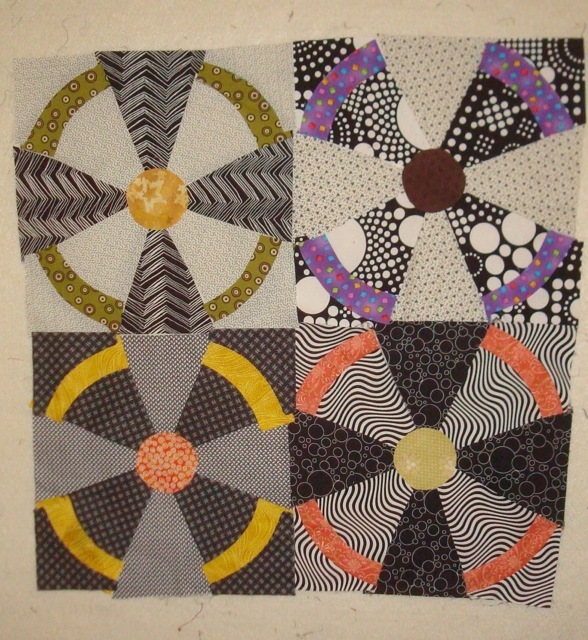 Red is also energetic, but my last black & white quilt (i.e. The Wrong Color of Red) used red and I want to use something else. The greens I have are either not right, or I don’t have enough and I want to keep the “B” blocks all the same. Conceptually, blue works since they are supposed to be AIRships. Maybe I should look for cloud fabric. 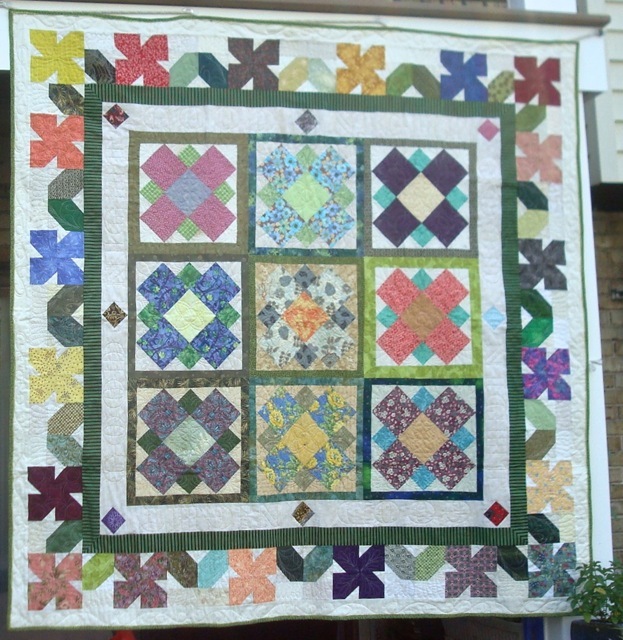 I like the blocks on point, and the thought of having those empty spaces to put quilting in kind of tickles my fancy… although what kind of quilting to put there remains to be seen. 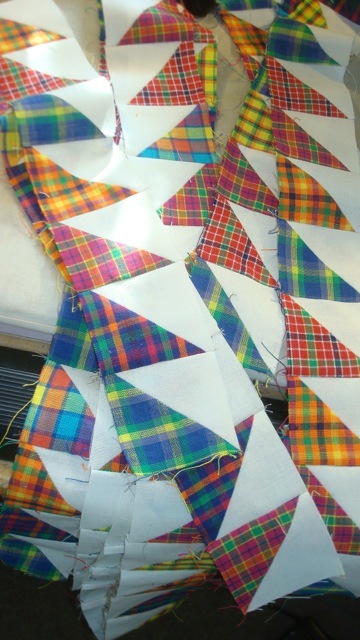 In addition to the Airship blocks, I am quilting In Full Bloom on the long arm. It’s turning out really cute. 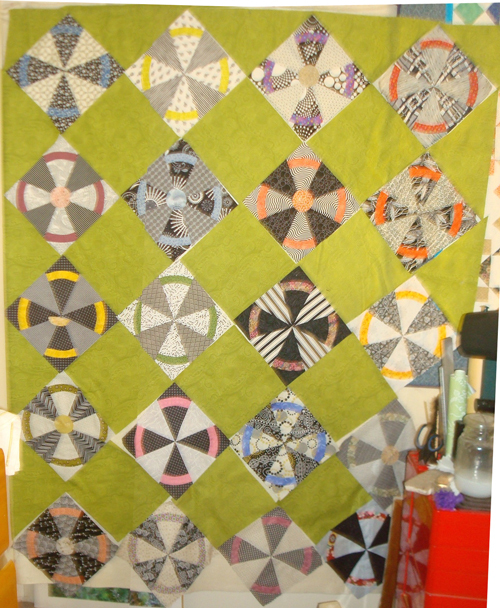 Except for one border (the green and black one), it’s all designed. I may just leave that one blank since it’s only 2″. 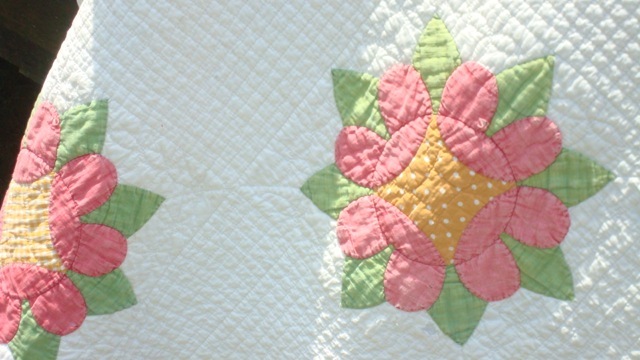 I did the quilting on In Full Bloom block by block. It’s really cute! (There’s an additional plain border added since I photographed it as a top.